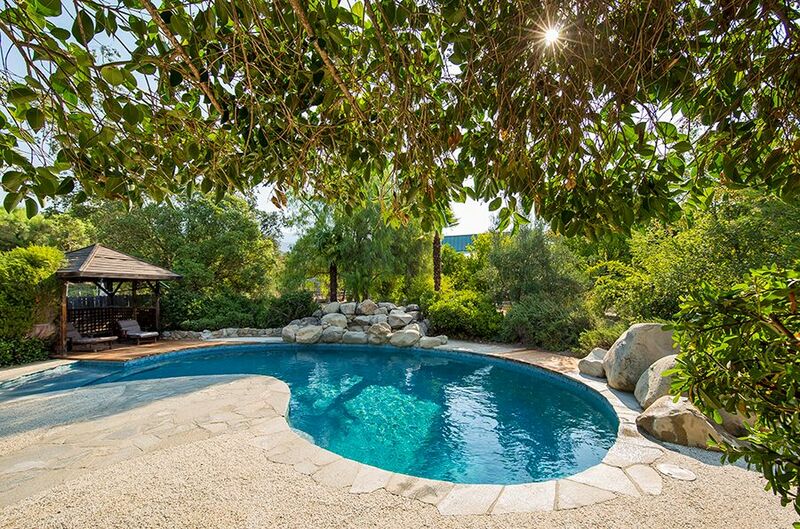 Fabulous 2 acre gated estate in Ojai's East End with a 3040 square-foot main house, pool and brand-new 700 square-foot, custom built detached guesthouse. The main house has four bedrooms, 3 1/2 bath. Home is a two story structure with a large master suite, second master, and several private balconies and patio areas. There is a traditional fireplace in the living room and a wood-burning stove in the dining room. Floors are a combination of Spanish tile, finished concrete and maple hardwood. In the past five years, many upgrades have been performed including; Hardwood floors throughout upper level, new carpet, refinishing of concrete floors, new hot water heater, new underlay of entire roof, solar system, paint, bathroom remodels, new porch, new arbor, new balcony off second master and new window in dining room. The pool was refurbished in 2014 and has a beautiful water-fall as well as new redwood deck. It is located in the center of the property and is surrounded by a variety of fruit trees. The guest house is brand-new and secluded on the back quarter of the property. It has an open floor plan as well as all the amenities including, washer dryer, dishwasher, central heat and air, propane as well as hickory hardwood floors and granite tops. This gorgeous property has a garden area and large chicken coop/horse corral. It is zoned for horses and the site plan is county approved for a barn with bathroom(buyer to verify).